The proportions of bicarbonate of soda and acid (either sour milk or cream of tartar) may be incorrect or the flour and raising agents may have been insufficiently sieved. Speckling can also occur if granulated sugar, or too much sugar is used. You may have used too little raising agent or over handled the dough before it was baked. The oven may have been too cool. 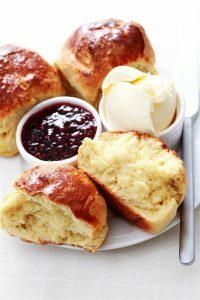 To get a nice brown top to your scone, brush egg or milk on top of them. If you had done this, then the oven may have been too cool or the scones were baked on a shelf that was too low in the oven. The mixture may have been too wet or the baking tray might have been too heavily greased. Twisting the cutter when cutting the scones can also have this effect. The dough may not have been an even thickness when it was cut; this is normally due to uneven pressure on the rolling pin when rolling. You also need to make sure that you need the dough for long enough as this helps to evenly distribute the raising agents. This normally happens as a result of either inadequate mixing or insufficient kneading.